Challah, or "egg bread" is a yeast-risen dough that is enriched with eggs. It is pillow-soft and ever-so-slightly sweet with a golden, chewy crust. Challah is a traditional Jewish braided bread. It is fairly simple to put together, making it perfect for celebrations as well as everyday eats! Although simple to make, challah does take some time and planning. Since challah does require a bit of commitment, it is best not to let any of our hard work go to waste. Fortunately, bread pudding is even better with day-old bread. So when you have left-over challah, make bread pudding! 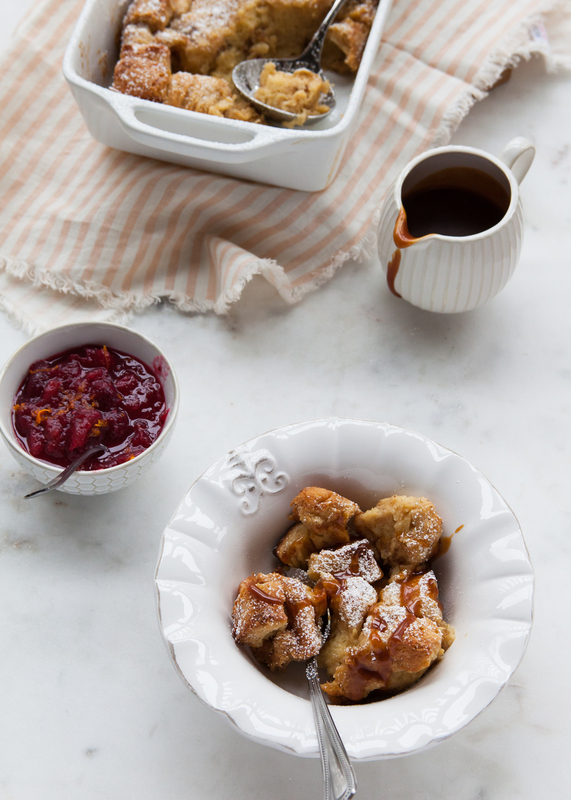 Bread pudding itself is the ultimate comfort food. Warm, custardy, sweet, and spicy, bread pudding is usually baked up in a batch and shared with loved ones. Top it with caramel or whipped cream, and it becomes the coziest treat of all! Wake up to warm breakfast pudding when you have a house-full of guests over the holidays or pass it around the table for dessert. I'm always tempted to make bread pudding because it is so easy to make and is a great use of leftover bread, eggs, and milk. Really, it's almost like cheating! Get the whole family involved by having the little ones cut up or even tear apart pieces of bread. Then, all you have to do is simply stir all the liquids and eggs together, toss with the bread, then bake! 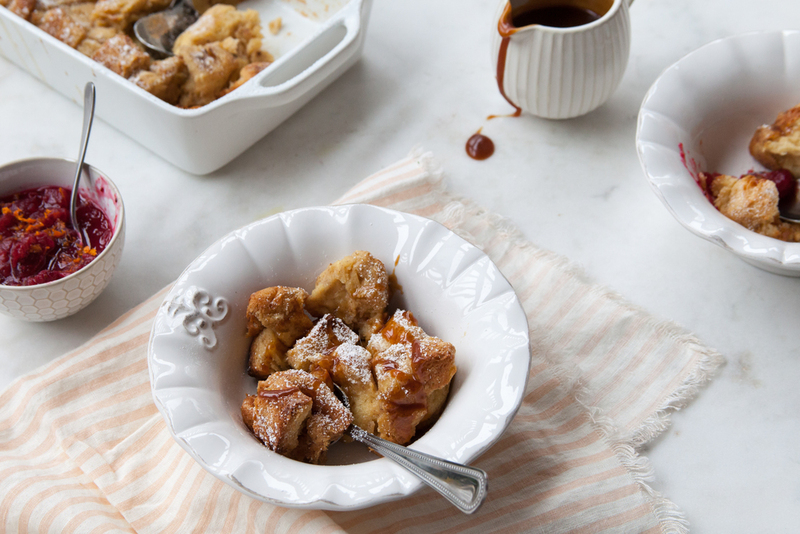 Cinnamon and nutmeg are the usual suspects when it comes to bread pudding. Instead of these typical offenders, I decided to use a masala chai-inspired spice profile. Cardamom, clove, and ginger, along with cinnamon, now what is cozier and tastier than that?! I replaced the milk in a typical bread pudding recipe with chai tea mix and enhanced the egg custard base with ground spices. To serve, I drizzled on some cinnamon caramel sauce along with some tart, tangy cranberry compote to cut some of the sweetness. Place the bread pieces in a large bowl. Mix together the chai tea, cream, sugar, and spices. Whisk in the eggs and pour over the bead. Let sit for about 15 to 20 minutes. Meanwhile, butter and sugar a medium baking dish (mine was 9X6 inches: an 8-inch square would work great, too). Transfer the soaked bread and any left-over liquids into the prepared baking dish. Bake until the bread pudding if puffed, toasted on top, and set in the center (about 35 minutes). Stir the yeast into the warm water with a pinch of sugar. Let sit until the mixture begins to foam (about 5 to 10 minutes). Meanwhile, stir together the flour, sugar, and salt in the bowl of an electric mixer. Stir in 2 eggs, egg yolk, and the oil. Add the yeast mixture and stir until the dough resembles a rough, shaggy mess. At this point, attach the dough hook to the stand mixer. Knead the dough on low for about 6 to 8 minutes. Alternatively, knead by hand until the dough is soft and stretchy (passing the window-pane test). Place the dough in a well-oiled bowl and cover with a clean dish towel. Let the dough rise in a warm corner until it doubles in size (about 1 to 2 hours). Punch down the dough then let rest for about 5 to 10 minutes. Divide the dough into six equal pieces. Roll the pieces into long ropes, about 14 to 16 inches in length. Line the ropes of dough up so that they are parallel to each other and pinch the ends together. Braid the strands together then tuck under both ends. Transfer the braided dough to a line baking sheet and loosely cover with plastic wrap. Let rise again in the refrigerator overnight or on the counter for about 45 minutes. If left to rise in the refrigerator overnight, remove the dough about 2 hours before baking to allow it to come to room temperature. Whisk the remaining egg and brush the egg-wash over the entire surface of the dough. Bake in a pre-heated oven (375 degrees Fahrenheit) for about 35 to 40 minutes or until deep golden. Let cool for about 20 to 30 minutes before slicing.